Nursery care for infants and toddlers is available during the 10:00 a.m. service on Sundays. The Nursery is located on the second floor of the Parish Hall down the hall, second door on the right. Children are always welcome in church, too. To enroll your child in The Nursery, please click HERE. 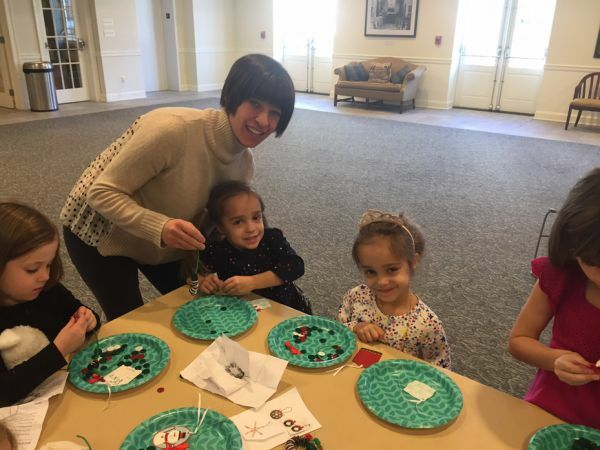 Our young children (PreK to 3rd grade; families are also welcome) gather at 10:00 a.m. just outside the Sherwood Room located on the second floor of the Parish Hall. Music, prayers, and a Godly Play story follow the same order of service as in the “big church,” all designed to be especially meaningful to young children. To reinforce the Godly Play story, craft and activity time will follow. To enroll your child(ren) and/or to volunteer, please click HERE. Grades 4-6 remain in the “big church” until they are dismissed to Sunday School before the sermon. Their time together is spent exploring the morning’s texts in a both a prayerful and a playful way. The Sunday Paper is a primary resource for these children, though they may also find themselves crafting with glue sticks and markers every now and then! To enroll your child(ren) and/or to volunteer, please click HERE. Designed in part to complement the confirmation class, this Sunday morning program is for our students in 7th to 12th grades. It’s here that our teens will find an opportunity to have thoughtful discussions that weave together faith, decision making and current events. There will also be certain days dedicated to learning about opportunities to serve in the church: acolyting, reading, etc. These young people will gather in Bleecker Hall just after the Gospel reading during our 10:00 a.m. service. To enroll your teen and/or to volunteer, please click HERE. On Morning Prayer Sundays (2nd and 4th Sundays of the month), everyone stays in their class until services are over. Parents come to pick up the younger children at the end of the service. On Holy Eucharist Sundays (1st, 3rd & 5th Sundays of the month), students return to the church and reconnect with their families for Communion. Parents of younger children may want to sit in the back of the church or balcony so that children and teachers can find them easily. Confirmation is a sacrament in which persons make a mature, public affirmation of their faith, a commitment to the responsibilities of the Christian life, and receive the laying on of hands by the bishop. (The person is confirming the promises that were made for them at baptism.) By custom, young people who are entering at least 7th grade are prepared for confirmation through a series of courses and community service. Aside from class time, confirmation students are expected to have regular Sunday attendance and take part in the Values & Virtues program on Sunday mornings. There will be at eight classes for students and four corresponding classes for parents. The classes will be held every other week in the months prior to the May Confirmation. The classes for confirmands and parents will follow the 10:00 a.m. service. Please contact The Rev. Jesse W. Lebus at [email protected] or 516-692-6368 x2.